Fall Makeup Tutorial in Youtube. It's so friggin' unique! A revolutionary new mascara designed to grip at lashes starting at the roots. 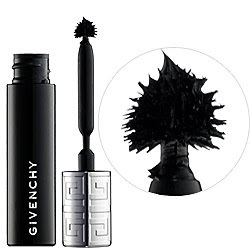 Givenchy Phenomen'eyes Mascara perfectly curls and separates lashes. It has a high-tech, patented round sphere at the tip of the precision wand that reaches every lash and adapts to all eye shapes. It's a Sephora exclusive. The result? 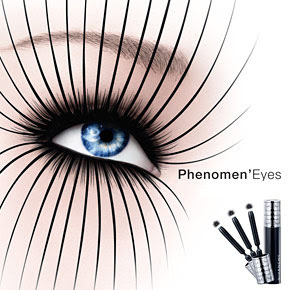 A beautifully fanned-out panoramic effect, holding the curve of your lashes perfectly in place. I've always been a bot wary buying expensive mascaras since i got this great tip from a pro makeup atrist that one way to save up with cosmetics is to not necessarily buy expensive mascaras because basically they can compare to cheaper ones and should be thrown up after 3 months. But definitely, you'll see me buying this one soon as it hit Manila or if it ever will be. I like the applicator a lot!!! I was actually wanting a bigger tip mascara so i can get into the inner corner eyelashes. The spherical-tip design could definitely reach in to my shorter lashes and coat them beautiful. And the mascara it self is made of elastomer to provide easy-glide application. Talk about taking mascaras to the next level! I just can't wait to get my hands on these. $27 isn't that much for a new high-tech mascara right? i hope someone gets this for me on my birthday? lol!!! Want to watch how it is use? Check out this vid of Sarah Victor.